The historical center of Grado concentrates the highest density of historical edifices and vestiges in the entire Grado. It is circumscribed by the former historical castrum of Grado. Basically, the center is marked by the so-called Campo Elia Patriarca, overtopped by several landmarks of great tourist value. 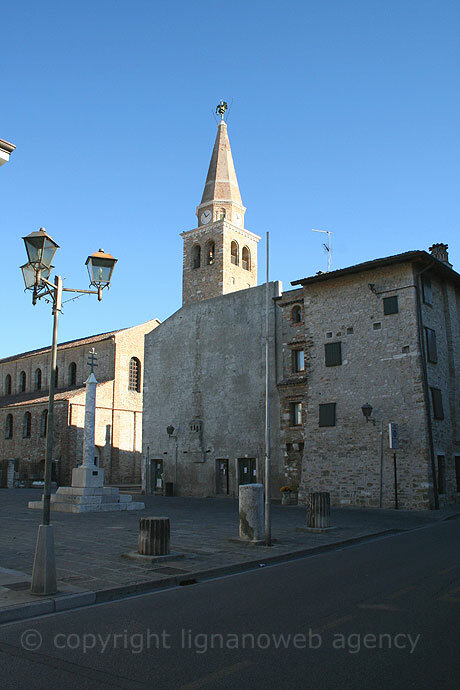 This is an architectural complex which calls forth the religious dimension of the history of Grado, being known Grado has often been used by the bishops of Aquileia as refuge and shelter against sundry political powers of their times. The three structures which overlook the historical center refer to the Basilica of Santa Eufemia, the Basilica of Santa Maria delle Grazie and to the Baptistery (the bell tower of the Basilica of Santa Eufemia), all dating back to sundry decades of the 6th century. The ruins of the Basilica della Corte, as well as the Lapidarium of Grado should also be mentioned, since they too contribute to the tourist value of the historical center. In order to protect this patrimony, the center is deemed a limited traffic zone, which means walking and biking are the most indicated for searching out this part of Grado. Another extremely vulnerable objective in the historical center of Grado, more precisely, in Piazza Biagio Marin, refers to an archeological site which displays vestiges dating back to the Roman era. The site is protected against traffic and sundry environmental hazards. The historical center of Grado does not only occasion sightseeing moments, but it yields further tourist opportunities. Plenty of top restaurants serving traditional specialties are located here. In addition, the westernmost beach of Grado, namely, Costa Azzurra, neighbors on the historical center, which adds to the list of incentives for spending time in this area. From a more practical perspective, plenty of hotels boast of being located within or nearby the historical center, capitalizing on their fortunate geographical situation on the island.